U.S. #2869n from the Legends of the West set. Christopher Houston Carson was born December 24, 1809, in Richmond, Kentucky. Carson’s father nicknamed him “Kit” and taught him all the skills for frontier living. As a teenager, Carson was an apprentice to a saddle maker in Franklin, Missouri. Customer’s tales of adventure lured him to the Wild West. 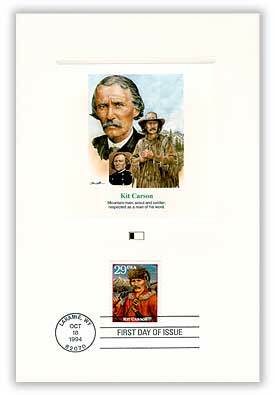 Item #4902076 – Carson First Day Proof Card. In 1824, at age 15, Carson ran away from home to join a caravan of traders bound for Santa Fe. He was instructed in the art of fur trapping and trading – a career he pursued for fifteen years. Carson then moved to Taos, Mexico, in 1827, where he learned Spanish and became an interpreter. Two years later, he joined a trapping party and traveled throughout the West, battling the elements, starvation, and Indian attacks. 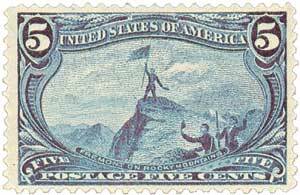 In 1842 a chance encounter with explorer John C. Fremont made Carson an active participant in extending the boundaries of the continental US. Carson served as a guide for three of Fremont’s government-financed expeditions until 1846, when he joined up with General Stephen W. Kearny, whose command was heading for California with presidential orders to take over the region. Alternately fighting and scouting, he earned a reputation for bravery, loyalty, and devotion to duty. U.S. #288 pictures Fremont in the Rockies. In 1853, Carson began serving as an agent for the Ute Indians. He gained their respect by working for their interests rather than those of white settlers. Carson and his wife Josefa often fed and housed Indians who were visiting Taos. When the Civil War began, Carson joined the Union as colonel of the 1st New Mexico Volunteers. Much of his time was spent fighting hostile Indians. Following the war he was appointed superintendent of Indian affairs for the Colorado Territory. Carson’s fairness and sympathy for the plight of Native Americans made him an ideal choice for the position, which he held until his death. 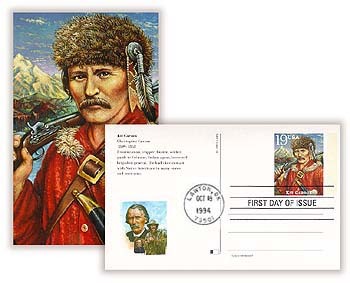 U.S. #UX191 – Carson First Day Postal Card. By 1867, Carson’s health was failing and retired from the Army. His wife died the following April and he passed away a month later on May 23, 1868. 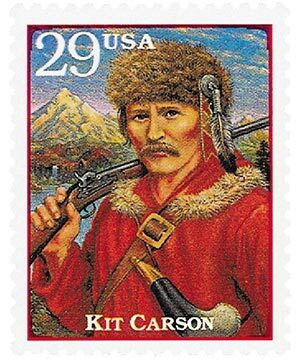 By that time, the legend of Kit Carson had grown as east coast authors exaggerated his exploits in magazine articles and cheap novels. The real Carson was embarrassed by his fame and preferred his simple, rugged life. U.S. #2869n – Mystic First Day Cover. 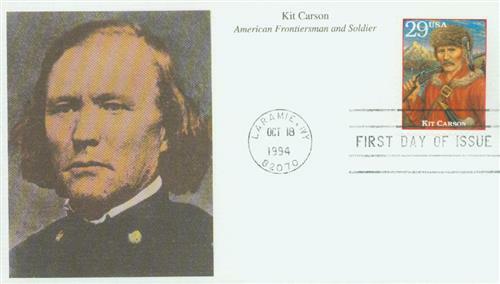 Kit Carson’s contributions to the westward expansion of the United States rank him as one of the nation’s great folk heroes. Not easily forgotten, his name is preserved across the American southwest, including Nevada’s capital, Carson City. Click here for more from the Kit Carson Home and Museum in Taos, New Mexico. 6 Responses to "This Day in History… December 24, 1809"
A great and enjoyable read. As I now live in the UK after moving from the US in the early part of my life it keeps in contact with the history of our great country. At the second paragraph of this article, you write that “Carson then moved to Taos, Mexico” which is misleading. Taos is located in New Mexico, USA, not Mexico. As a native New Mexican, I frequently observe others confusing the state v/s the country. New Mexico became a state of the Union on January 6, 1912. After more than 100 years, it is hard to believe that this confusion still persists. As a native New Mexican you should be aware that Taos was located in Mexico until it became a territory in 1850. It is hard to believe this confusion exists. It was 1827, New Mexico probably wasn’t even a concept at that point of time. King Philip II of Spain created Santa Fe de Nuevo México as a province of the Viceroyalty of New Spain in 1598 according to Wikipedia. New Mexico is thus the oldest continuous government administrative designation in the United States.